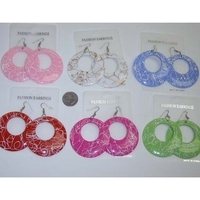 $15/DZ EARRINGS, CLASSIC HIP SHAPE, COMES IN 6 COLORS, GREEN, PINK, WHITE, FUSCHIA, BLUE, AND RED. HAS WHITE SQUIGGLEY LINES THRU OUT. THE WHITE PAIR THE LINES ARE GOLD COLOR.